This resin shark jaws ornament from Kurt Adler is a cool and unique addition to any holiday decor! Its white design is modeled after a shark's jaw and is complete with a full set of shark teeth. This beach chair family of four ornament for personalization by Kurt Adler is perfect for any family of four that love the beach! The ornament features four beach chairs in the sand, overlooking the beautiful blue water and sky. This ornament can be personalized easily with a fine tipped sharpie marker. This beach chair family of five ornament for personalization by Kurt Adler is perfect for any family of five that love the beach! The ornament features five beach chairs in the sand, overlooking the beautiful blue water and sky. This ornament can be easily personalized with a fine tipped sharpie marker. 3.75 inches tall Cancer, the crab, is the fourth sign of the zodiac. People born under this sign are sensitive, traditional, and nurturing. In ancient Greece, crabs were considered to be sacred, and in many eastern countries they are a good omen. In China the crab is a symbol of wealth and a happy marriage. This ornament features Santa Clause on a real sand dollar. 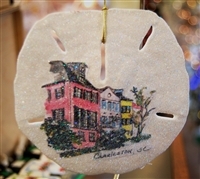 *"Charleston, SC" is on all sand dollar ornaments. This ornament features palm trees on a real sand dollar. 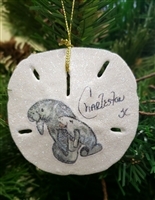 Hand made real sand-dollar ornament made in South Carolina. Hand made REAL Sand-dollar ornament. Made in South Carolina. Hand made REAL Sand-dollar ornament. Made in South Carolina. Hand made REAL Sand-dollar ornament. Made in South Carolina. Alligators are living fossils that can be traced back - million years. Members of the crocodile family, their name comes from the Spanish word for lizard el largato. Over a million alligators live in the southern United States. They are considered to be very clever and are fast learners. Hand Painted Locally in Charleston, SC. Having traveled the seas for over 100 million years, sea turtles have essentially remained unchanged. They survived beyond the extinction of the dinosaurs and are still present in the world's oceans today. All sea turtles are on the endangered or threatened species lists. The Beach Bucket ornament is a reminder of summer childhood days spent at the shore. Memories of hotdogs, ice cream and playing in the sand come to mind. In those days a good, sturdy Beach Bucket and small shovel was all that was needed for hours of fun. This is a glass ornament that is approximately 4 inches tall. The ornament features decorative hanging lights and a clear string. A perfect keepsake to remind you of your trip to the beach. This ornament is hand painted from the inside with a curved brush and each is done 100% by hand. Featuring Charleston style homes on water front view. Founded in 1976 by a U.S. Veteran, Beacon Design is proud to be the leading ornament manufacturer in America. Each ornament is designed, manufactured and assembled by hand at ChemArt Headquarters in Lincoln, RI. 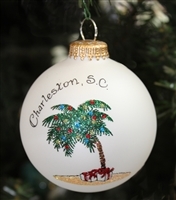 Handcrafted in the USA, this beautiful ornament features a sparkling palm tree. The ornament is a large/over-sized frosted ball and is approximately 3 1/2 inches. This item comes in a beautiful windowed gift box. A wonderful gift or keepsake to show southern hospitality. Hand painted in North Carolina on American Made Glass! This beautiful ornament features two sailboats on the water. Each ornament comes in a windowed gift box.